The beauty and bounty of the Cosumnes River is worth the trip. The Cosumnes River in northern California has been a reliable gold producer for many years. Miners have been working in and around the Cosumnes since the early days of the California gold rush in the mid-1800s. 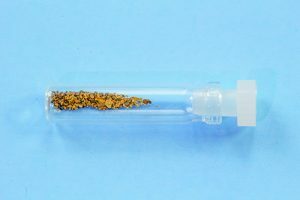 Early on, miners worked with pan, cradle, and sluice to recover placer gold from the banks of the Cosumnes. As mining techniques became more sophisticated and better financed, larger operations moved in. According to the California Division of Mines and Geology Bulletin 193, substantial amounts of mining took place on the lower Cosumnes in the Michigan Bar district. 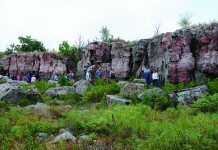 The area was hydraulicked extensively starting in the 1850s. Later, dredging operations were conducted and continued on into the 1940s. Over a 90-year period, Bulletin 193 states, it’s estimated that at least 1,700,000 ounces of gold was recovered from the Michigan Bar district alone. According to Erwin Gudde’s publication, "California Gold Camps," further upstream in the Omo ranch area near the Middle Fork of the Cosumnes, several hard rock mine operations started in the late 1800s. There is also a record in Gudde’s publication of early mining activity in the area of Pi Pi Valley near the Middle Fork. The author uses a nugget sucker made from PVC pipe to pull material out of submerged bedrock crevices. The Cosumnes originates on the western slope of the Sierra Nevada Mountains at an elevation of more than 7,000 feet. In its upper reaches, it is divided into the North, Middle, and South forks. The three forks run in a general westerly direction before joining together and eventually flowing into the Mokelumne River in the Sacramento-San Joaquin river delta area of California’s Central Valley. 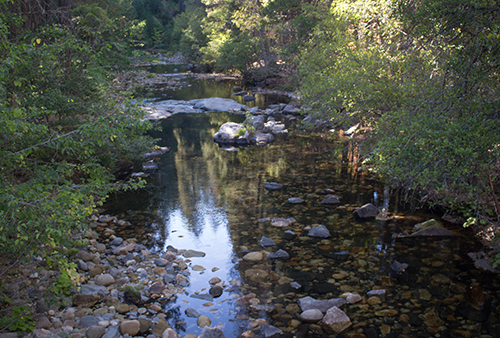 A substantial amount of the Cosumnes runs through the Eldorado National Forest. A great deal of national forest is open to mining, including claim-staking. Areas that have claims filed on them are off limits to the casual miner unless permission to mine can be worked out with the claim owner. However, a bit of research indicates that several areas along the Cosumnes are closed to mine claim-staking but open to casual mining. 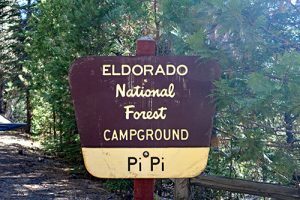 One of the open locations is Pi Pi Campground (pronounced ‘Pie Pie’ and sometimes spelled Pipi). In the hope of finding some gold, I visited Pi Pi Campground in early October. The weather was sunny but noticeably cool in this area of the Sierra Foothills. I entered the campground and located the camp hosts to inquire about rules for camping and day use. At this time, I also asked if I could get the inside scoop about gold prospecting. The host couple was very personable. 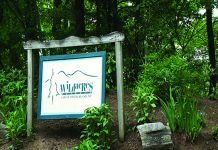 For day use during the 2018 season, parking was free of charge at designated day use areas both inside and outside of the campground, they stated. They also mentioned that this policy could change in the coming year. Fees for overnight camping were in effect for tents, RVs, and trailers, and camping was seasonal. The 2018 camping season ended in mid-October. It is likely expected to open again in April. Yet, river access remains open to walk-in traffic year round. This sign marks the entrance to Pi Pi Campground. small flakes. According to the hosts, this area has been worked for many years. Because of this extensive use, the hosts said it is unlikely that sizable nuggets could be located, as none had been reported during their time as hosts. However, since the mining area extends for well over a mile where the river flows adjacent to the campground, as well as the overflow use area downstream, I figured with a little knowledge of where to look and a bit of luck, one might find enough gold to be happy. Perhaps one could find an area where a tree had been recently uprooted, providing fresh, unworked ground. Or, maybe an area with limited access could provide some opportunities. Following my conversation with the camp hosts and a few campers who were gold panning, I decided to check out the river. I found there was a paved, handicap-accessible path that ran for more than three-quarters of a mile along the Cosumnes, in front of the campground. I hiked the path to determine the conditions of the river and check out likely places to prospect. I discovered that the water was quite low at this time of year. Most of it was knee-deep or lower. I noted several miniature islands in the river, created by exposed gravel bars. I also spotted a few areas with exposed bedrock. Some of the bedrock was above the waterline on both sides of the river. 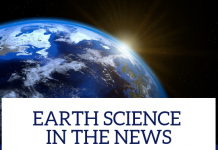 In some cases, the submerged bedrock had little or no overburden on top of it. These conditions appeared to provide some possibilities for finding gold. 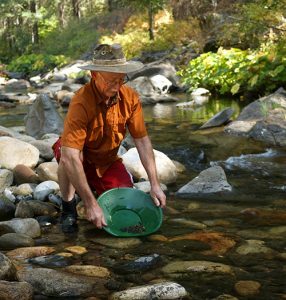 If a miner was spending a few days at the campground, taking the time to prospect several of the gravel bars using a gold pan, they might discover a bit of gold. Once gold is located, it may pay off to switch to a sluice box to increase the volume of pay dirt that can be processed. The exposed bedrock kept the gold rather close to the surface and therefore provided areas searchable with a good pulse induction metal detector designed for hunting gold. 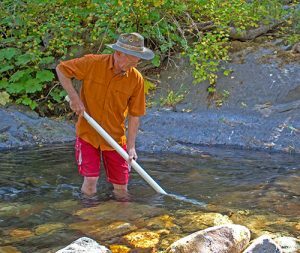 Pulse induction detectors are capable of handling high mineralization and hot rocks that are commonly found in gold-bearing rivers in California. Since there was minimal overburden in these areas, hardy souls willing to brave the cold water with a wet suit or perhaps a dry suit could try their hand at underwater sniping where the bedrock extends into the river underwater. (More information about sniping can be found in the January 1998 issue of Rock & Gem.) Using a dive mask, snorkel, and specialized tools to clean out underwater bedrock crevices could yield a nice payday. Since these areas may have already been worked, an industrious sniper could bring a shovel and clean off sections of bedrock where the overburden is thicker. This technique may reveal some fresh areas where gold could still be lurking. The author pans sluice box concentrates in the hope of finding gold. As with many mining areas, it could take several days to thoroughly investigate the many possibilities in this area. Unfortunately, I only had one day to check out Pi Pi campground for gold. Normally, I would spend a considerable amount of time prospecting with a pan to locate an area that was yielding some reasonably good pay dirt before setting up my sluice. With limited time, I reviewed my options. Knowing that I would be using a molded plastic sluice that is quick to set up and quick to clean up, I decided to bypass the prospecting step and went straight to my sluice box. I figured I would run one bucket of dirt, then do a cleanup. If I had some decent gold, I would keep working. If not, I’d move on to a new location. I parked my vehicle in the day use section of the lot and searched for an area I hoped had not been extensively worked previously. Plus, I looked for an area that had a good flow of water where I could set up my sluice. Having reviewed the rules for prospecting online before my visit to the campground, I knew it was legal to alter water flow enough to make a sluice function properly. Once I found a promising spot, I set up the sluice and went to work. When I’m digging below the waterline, I use special digging tools. One is a small shovel sometimes referred to as a floral shovel. Its blade is smaller than a standard number two shovel. The small size of the blade allows access to tight spaces and between boulders that might be on the river bottom. The model I have has a long handle so I can reach deeper underwater, but what makes my shovel really unique is that I had some angled metal welded to the sides and back of the blade. The angled metal keeps dirt from washing off the shovel as it is raised out of the water. Another digging tool I use is a bucket digger. It’s similar to a large ladle and can be used to scoop dirt out of holes in the river bottom. The configuration of the scoop also prevents dirt from flowing back into the river when the bucket digger is raised out of the water. Another mining tool I use for collecting pay dirt while working below the water line is a PVC pipe nugget sucker. When I get the bedrock nearly clean, I use this hand-powered suction device to pull material out of exposed bedrock crevices. These crevices are likely places for gold to collect. Using these various mining implements, I removed sand, gravel, and rock from the river bottom and ran it through a bucket grizzly. The bucket grizzly allows the smaller material to pass through a set of bars and fall into a bucket where it is retained while the larger material is screened off to the side and discarded. Eliminating large rocks from the material I run through the sluice allows it to collect gold more efficiently. If the water flow through the sluice was too strong, it would likely wash smaller gold through the sluice along with the big rocks. Since I wanted to target the small gold, classifying my material was a prudent move. sluice box. The water flow through the sluice seemed to be just right. The lighter material washed through the box while the heavier material was collected behind the molded plastic riffles. After running the entire bucket of material through the sluice, I did a quick cleanup to save the concentrates that had collected behind the riffles. After panning the concentrates, I was pleased to find that I had some gold. Not a lot and nothing large, but there were enough specks and small flakes to make my sluicing fun. Upon discussing my find with the camp hosts and some other campers, I figured I was luckier than most. With that, I decided to stay in the same location and run buckets of dirt through the sluice until my time ran out. At the end of the day, I had a nice little pile of gold in a vial to show for my efforts. I was quite happy with the amount of gold I found, which I suspect was more than the typical find, considering the area had been worked hard for many years. If you decide to visit Pi Pi campground in search of some gold, be sure to check the latest information regarding dates when the area is open for camping and RVs. Be aware that I didn’t see any hook-ups for trailers and RVs. Everything appeared to be self-contained. For tent camping, the restrooms are pit style. During my site visit, there were signs posted notifying campers that potable water was not available. All water had to be brought in. My final take on the area is that Pi Pi isn’t the place to come if you are looking for big or abundant gold discovery. Odds are very strong that you will not find enough gold to pay for your gasoline for the trip, likely not even close. However, if you enjoy the outdoors and are looking for a place to go camping with the opportunity to hunt for gold, then Pi Pi campground is worth considering. There is plenty of territory to check out, much of the river is easily accessible, and you don’t have to worry about getting on someone’s gold claim. Who knows, you may be one of the lucky ones. Note: Upon returning home, a phone conversation with a Forest Service Ranger indicated that the gravel islands could be worked, provided no vegetation was damaged, holes were filled when done, and that common sense was used to not tear up the place. 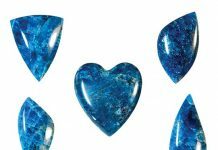 Previous articleRock & Gem Kids: Is Your Artifact Really a Geofact? Next articleEquipped to Create — Reentel Inc.